Of the numerous mentions of LSC in LTHforum posts, the vast majority have been favorable. The popularity and success of LSC is evident from its opening branches at several locations outside Chinatown. My experience however is limited to the Chinatown branch. This is one restaurant I have returned to many many many times, more than any other in Chicago. There are a lot of restaurants in Chinatown and it is not very hard to step into one and then another and not particularly realize the difference. The first time I placed the food at LSC in my mouth*, I knew at once that this was a 'Chinese' restaurant that far far different from any other. I had known before I went that the food from the Szechuan region was different - and spicy; not much more. Since then the fabulous food has brought me back time after time - they have a very extensive menu - eager to try a new dish and learn more. I have never been disappointed on my visits, even if some particular dish was not to my liking. Now when I go, I order something I've tried before and really liked (there are many**) and something else I haven't tried. This way every time I've gone , I've been more than sated. I haven't eaten my way through the menu, not even close, but LSC makes me wish for the day I can say that I have - just so I can start all over again. When I'm going through a rough patch, when I'm celebrating, when I'm craving exotic food, when I just feel like a simple meal, I end up at LSC. And I'm glad for it. We've also been accommodated with dishes that may not have been on the menu exactly - Cui Pi Fish (deep fried whole fish) with a sweet and sour sauce for my father's birthday, Xiang Xu Shiao Bing (iirc) a dessert we were treated to on my wife's birthday. Restaurants like LSC make Chinatown a great neighborhood. In short, that is why I would like to nominate LSC as a GNR. My One Shot at Chinese in Chicago: but where? *Boiled beef in Spicy Szechaun sauce. Last edited by sazerac on June 14th, 2005, 9:33 pm, edited 1 time in total. I'm more than happy to jump in and second this nomination, having just admitted in my own nomination of Moon Palace that LSC was my choice for my last birthday dinner. I was taking it for granted that someone else would nominate LSC and wanted to use my one chance for a less obvious candidate. Here's a question that more properly belongs on site talk, though. Are we nominating just the Chinatown Square branch or all of them? And if the latter, do we even have any reports on some of them? I'd hate to see the Westmont branch (which I think is every bit as good as the Chinatown Square mother ship and could especially benefit from whatever publicity we generate) not getting a sticker or card, or whatever is being given out, but on the other hand it doesn't seem right a branch that no one's tried should get one on faith. LSC will always have a special place in my heat, because at least some aspect of our community had its genesis there--and kudos again to Seth Z who first had the chutzpah to gather the hounds. I'd vote for both the Chinatown and Westmont branches being given the sticker. The others haven't been discussed much or at all, but chinatown and westmont have both been mentioned in a number of threads. Oh, and I'd have seconded this if my mom didn't beat me to it. The Westmont location is also one of the most child-friendly restaurants I've ever been to. The staff are wonderful with the kids, and there are almost always extended families with small children at the other tables, too. Small point of clarification, Sazerac - are you nominating LSZ Chinatown, only, or Chinatown and Westmont? I think it is Chinatown, only, though while there are not many mentions of Westmont, they all do seem positive. Your choice, though, on what you want to send to the mods. There's also LSC Express, at about Ashland and Taylor, but it's, well, not the same. As noted above, the original GNR award is for the Chinatown location only. As a west suburbanite who regularly goes to LSC in Downers Grove, and has enjoyed LSC in Chinatown more than a couple of times, I feel both places deserve the designation - LSC in Downers Grove is absolutely a great restaurant in this neighborhood. There are differences, and on balance, LSC in Chinatown is better. LSC in Downers has maintained much of the old Lo Gardens, Cantonese/American menu, so one can get Egg Foo Yung in all its terrible splendor. And the menu is not not quite as rich and varied. But the best things are all there, and while the preparation may not always be as great as Chinatown, it is usually very good indeed. So I suggest we expand this designation to include both Chinatown and Downers Grove, and maybe Palatine, though I cannot comment on that. What do others think? Having just come from lunch at the Downers Grove LSC with a great group of LTHers, I'll have to agree with Dickson's sentiment above. I found the food at the DG location perhaps a half step below the Chinatown location, but it was still very good. Considering the relatively adventurous offerings compared to most of the other Chinese places in the area, the friendly service and reasonable prices, I feel that LSC Downers Grove is very deserving of a shared GNR. I also think that the Palatine location should not be included simply because no one has been there and posted about it one way or the other. P.S. The egg foo yung was not the dish that caused me to come to this opinion, but the Szechaun standby's were. That's a call for the GNR Czar, but IMO, a single post by a single diner getting carryout over a year ago does not a GNR make. In the case of DG, we had 8 LTHers sharing a meal of some Chinatown "standards" along with a new (to me) dish or two. Hopefully, some of the other 7 people at our lunch will post to give some weight to awarding a GNR to the DG location. I've been to the Chinatown LSC maybe six times and have probably had most of the favs at least twice. Got to say, today's lunch was as satisfying as any I've had in the Chinatown branch. The maw (which was served without complaint) was quite good -- really better than the last platter of the stuff I had in the Chinatown mall. Wiviott cruelly mocked kithat when she wanted to order the shrimps in mayo sauce, but she ordered them anyway -- and I had thirds. It was probably less than authentic, but it was really good: crunchy and sweet (sweetness was, however, a problem with other dishes). Little eggplants, somewhat oily, but nice looking and pretty tasty. Frankly, if Lao Szechuan - Chinatown was nominated and passed GNR muster the very first time around, then it is the only location which qualifies for consideration for GNR re-affirmation. That is if we are really crossing our T and dotting our I. If we are expanding this endorsement to Downers Grove, especially based on a lunch today, then summarily dismissing NW location because someone didn't call out the troops is pretty weak. Especially when neither Downers GRove or the NW were ever nominated in the first place. I do trust Zim's response to NW location tasting like Chinatown location. I also have been there and felt it was the same experience practically down to the menu. I once stayed late enough to see all the cooks jump in a van for the ride home to Chinatown. I will affirm the Chinatown location. Happy to go along with granting same to Downers Grove, though I would prefer it was granted the NW location as well. Yes, truly a call for the GNR czar, but as I think about it, I would suggest that we let LSC West be nominated independently in the next round rather than rolling it in. Mocked ? More like good natured jibe, never meant to deter, and turned out not bad at all. Actually it put me in mind of the time you insisted on stopping for a McShake around Saint Paddy's day. Far as LSC Downers Grove, good service, nice people, their own parking lot, no driving around for a space like LSC Chinatown, food came out blazing fast and chili oil on the table. We had a number of direct comparison dishes to LSC Chinatown, Three Chili Chicken, little less crunch with an upfront, as opposed to background, sweet note; Ma Po Tofu, close, if not exact to CT branch; Sliced Beef and Maw Szechuan Style, Five Powder Rabbit (Szechuan Spicy Rabbit w/bone), Jellyfish and Eggplant in Garlic Sauce, maw, jellyfish, rabbit all nicely parallel LSC Chinatown, Lamb w/cumin, a bit light on the cumin and overall spice. Our, or should I say Steve Z's, must try from the Lo's Garden menu was egg foo yung, which I found a very good version of the Chinese American classic. I generally agree with the LSC Downers Grove sentiment, it's a half-step off the LSC Chinatown, little less heat, little more sweet, but I very much enjoyed lunch on the merits. It was, as always, a treat to dine with the group and meet LTHer Kitthat, even if she did order shrimp in mayo sauce. LSC has a number of inexpensive lunch specials which, combined with speedy service make it a good choice for a quicky lunch in the area. Czar, eh? I always thought of myself more as a poobah. Anyway, if we only have evidence that the three outposts of this mini-chain all seem to maintain similiar high standards and present similar menus, I think we ought to consider granting all three GNR status. As to whether we should consider doing this in this renewal phase, or as a serparate new nomination. I agree with the strict constructionist interpretation that the original intent was to just nominate the CT location, so we should follow that, but as a matter of practicality it seems like if we are going to have all the LSCs be GNRs, then having them all in synch makes the most sense. Still, I would be happy to have opinions from others, including the OP, Sazerac, as to whether we should wait or just do it. Oh, and the meal was pretty much as I noted above and expected. It is not as good as LSC CT, but it is good, and the offerings are delightful. And my guess is that some of the variation we experienced is just a simple matter of who was cooking - the last time I had the Lamb with Cumin, for instance, it was spicier, more dappled with Cumin, and generally better. And even yesterday, the two orders of Tony's chicken differed more than just in the heat and crispiness (we ordered the second one hotter and crispier, which they did) - the sweetness was backed off a bit. That could just have been because it was obscured by the chilis, but I wonder if the cook was not intentionally increasing sweetness to please the gringos and he decided when we ordered more, spicier, that he should back that off. Just some thoughts, and it does not reflect on my support for the LSC chain, either way. Sometimes pictures can say 1,000 words. Since they are my pictures they say more like 10 words but most of them are some form of "yum". This, for me, also falls on the "total no-brainer" list. I can't imagine it not being a GNR. If an all-time list were made of restaurants that have generated the most LTH swoonage, surely Lao Sze Chuan would make the top ten, no? I'm a fiery yes!! This restaurant never disappoints, and I have never had an off night there. It's also a GNR where just about everything on the menu is good, and I don't have to make sure I "order it the right way" to get great authentic food. The way that Lao Sze Chuan has become the board's (deserved) favorite, one wonders whether we will soon become LSCforum.com. I go to Chinatown often, lunch, dinner late night and after 'Little' Three Happiness Lao Sze Chuan is the place I go most often. 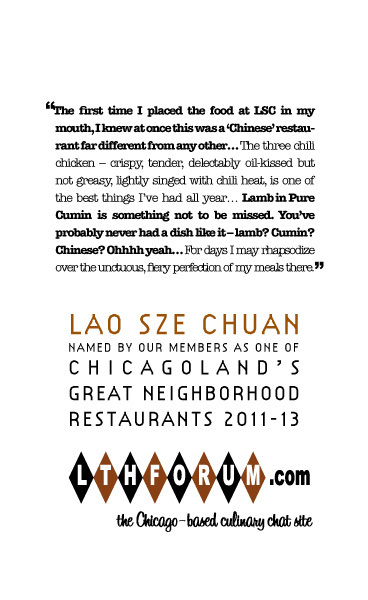 My love for LSC, in particular Sliced Beef and Maw Szechuan Style, is well chronicled on the pages of LTHForum, suffice to say shi for renewal. LSC was my training grounds when I had to go to India for work. Twice a week to get my heat tolerance up... The boy and I love their hotpot (not so much the way we smell after!) and the Downers Grove outlet is where we bring his parents to when we visit them. Lao Sze Chuan along w/Khan are the places I miss most when not in town. Big yes for renewal. As many new places as have popped up in Chinatown over the past 2 years, LSC is still the one I choose first, more often than not. There are at least 2-dozen menu items I love at LSC, and it continues to be my personal favorite Chinese restaurant in Chicagoland. Part of this is because Sze Chuan is my favorite Chinese cuisine but it's also because there's a consisitency and reliability at LSC that I've yet to find at any other Chinatown spot. I heartily endorse renewal. In my standard rotation, there's @ least a dozen dishes I crave. Another place I often bring out of town chefs to. Yes on renewal. I go, I enjoy, I plan my next visit. Aside from being on my regular lunch rotation, LSC in DG is also a good place to meet friends and family for dinner, and I have yet to get any complaints (okay, I may dumb down, or at least go light on the heat when ordering). After all these years, the "chicken crack" is still every bit as addictive, the mapo tofu is still the ideal to which I measure other restaurants' attempts at this dish, the atmosphere is just as lively, and the service is still quick & friendly. LSC is consistent, dependable, and totally satisfying - every time I go, I leave happy (and with my lips & face still burning).